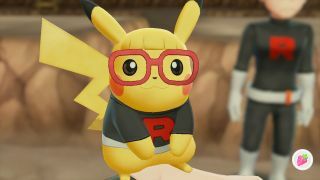 One of the big surprises for Pokemon Let's Go was the reveal that you can not only deck out your Partner Pokemon - Eevee or Pikachu - with adorable outfits, complete with glasses, hats and other accessories, but also give them hairstyles. The revelation that Eevee could have bangs and Pikachu could rock a bouffant curl very much broke the internet, but that hasn't stopped me wanting to give my personal Pikachu a new do. However, discovering how to access the various Pokemon Let's Go hairstyles in the first place is quite a tricky thing. In Pokemon Sun and Moon you could simply head to a hair salon to change your hairstyle, or change your Pokemon's look (or more specifically, your Furfrou's look), the ability to change your Pokemon Let's Go hairstyles is almost an Easter egg in itself. The only clue the game will give you is one random NPC comment that mentions 'messing' with your Partner Pokemon's hair. What that actually means is that to change your Pokemon Let's Go hairstyle you need to switch to handheld mode, and prepare your fingers for some folicular fondling. Head into the Play with Pikachu / Eevee section, and then to the Partner Play option. It's here that you'll be massaging your Pokemon's scalp to bring forth the full spectrum of hairstyles, which seem to be the same across both games, as far as I can tell. What I will say is that you need to start with your fingers on Pikachu / Eevee, otherwise it won't register the action, which can be quite tricky particularly for the more… unusual… Pokemon Let's Go hairstyles. So with all that in mind, here's how to get all the Pokemon Let's Go hairstyles for Eevee and Pikachu. For the super secret Afro Pokemon Let's Go hairstyle, you're going to need to get all 10 fingers involved. Put all 10 fingers on the screen at once (making sure at least one is touching Pikachu / Eevee) and then move both your hands in the motion as if you were giving someone a head massage. You should then get the super secret afro hairstyle, which means you can then turn your buddy into Napoleon Dynamite. Want more guidance on how to get the best out of Pikachu and Eevee's latest adventure? Why not check out our Pokemon Let's Go tips?